LENGTH X WIDTH X HEIGHT: 168.0 x 70.8 x 57.8 in. BOTTOM LINE: The VW Golf GTI is a fun car out and out, with good power and great handling. When it comes to automobiles, I am schizophrenic. My demographic group and my hair color lead me to large, comfortable American sedans. However, I was weaned on small British sports cars and the thrill of driving a fun small car is still in my blood. 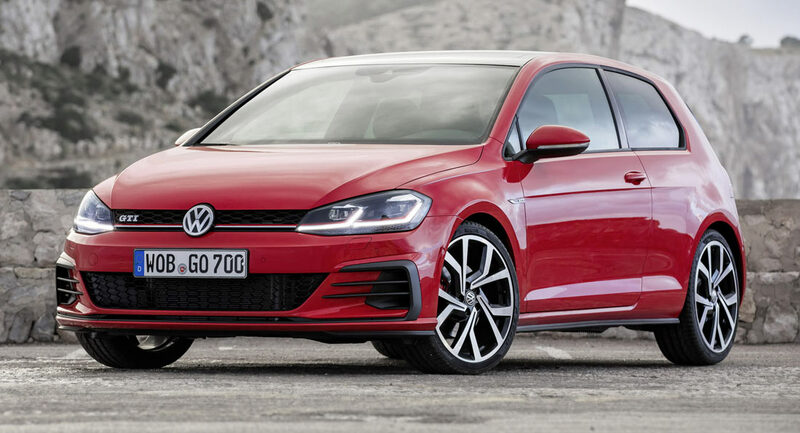 The Volkswagen Golf GTI definitely fits into the latter category. Unlike the sports cars that drove my passion many years ago, the GTI will fit four passengers in relative comfort. Okay, the rear seat is tight, but not as tight as in my MG.
VW’s first Golf (The Rabbit) debuted way back in the last century and it was a decent compact car. It was a total change for VW, being a water-cooled front-engined front wheel drive sedan after decades of the air-cooled rear-engined rear wheel drive Beetle. Over the years, the Golf has undergone several name changes, from Rabbit to Golf to Rabbit and back to Golf again. The GTI is the sporty version of the pedestrian Golf. The Rabbit Edition (defined by a little chrome rabbit on the hatch lid) adds even more sportiness, with 18-inch aluminum alloy wheels, black rear spoiler, LED headlights with adaptive front lighting, black mirror caps, blind spot monitor and rear cross traffic alert. The GTI sports a nice roomy cabin. Front seats offer good side support, that is needed when you do spirited driving. I could do without the plaid seating surfaces, but you can’t have it all. Under the hood is a 2.0-liter turbocharged four that is up 8 horsepower from last year to 228. This is more than enough for this little pocket rocket. I had an odd week with little high speed driving, but plenty of miles on back-country winding roads and hills. Needless to say, I thoroughly enjoyed myself. I also felt fully in control all the time, although there were instances where I pushed my limits. The shifter for the 6-speed manual gearbox has a nice feel. While six speeds are nice, in reality I needed only five because of the roads I chose. We had weather in the single digits during the week the GTI was in my driveway. Thankfully, the GTI has a great climate control system. With the heated seats we were soon dialing back the temperatures. Thankfully, the GTI has simple HVAC and radio controls, and a good clean infotainment screen tells you what’s going on. The Rabbit Edition is equipped with the Composition Color unit, featuring a 6.5-inch capacitive touchscreen display. The infotainment system also offers sD card and USB multimedia interfaces as well as a rearview camera and Bluetooth technology for compatible phones. In addition, the available VW Car-Net app for smartwatch allows drivers to control several security and service features. Owners can keep tabs on their cars from distances, remotely locking and unlocking doors and viewing the status of doors, windows and sunroof. I remember the original FWD Rabbit/Golf that replaced the Beetle and pushed VW into a whole new world. The GTI is the ultimate expression of that new world with power and handling unmatched by previous Golfs. It still looks basically there same (VW sticks with good designs forever, it seems), but it drives like a totally different car. Even if you don’t buy one, try to snag one for a test ride if you can. You’ll never regret the experience. The Most Helpful Volkswagen Research Information; Anywhere!